Discussion in 'Site Announcements' started by sothis, Oct 30, 2018. Today we’re announcing upcoming branding and design changes to Anime-Planet that have been in the making for some time now. We will have more concrete branding images and updates to show you in the next few weeks. Anime-Planet has never had a solid brand of its own, and we’re excited to show you the process and results behind a new logo and mascots for the site. 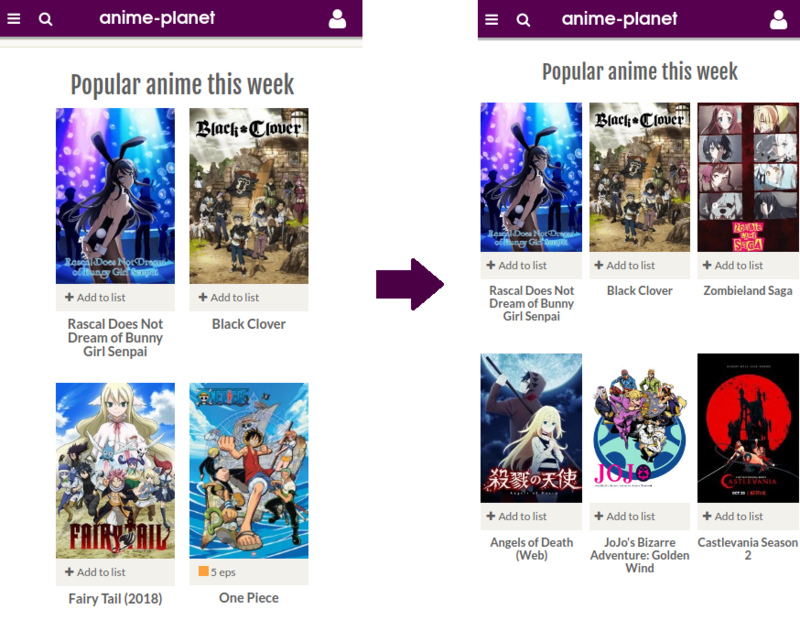 In addition to the branding changes, we’ve been working on a site redesign, in tandem with UX research, to improve Anime-Planet’s usability. The redesign isn’t ready yet, but we aim to release a new anime/manga info page as a first step in the next few months. In the meantime, today we’ve begun to roll out smaller changes that move towards the final redesign. More announcements and changes to come in the following weeks, leading up to major releases related to the redesign. 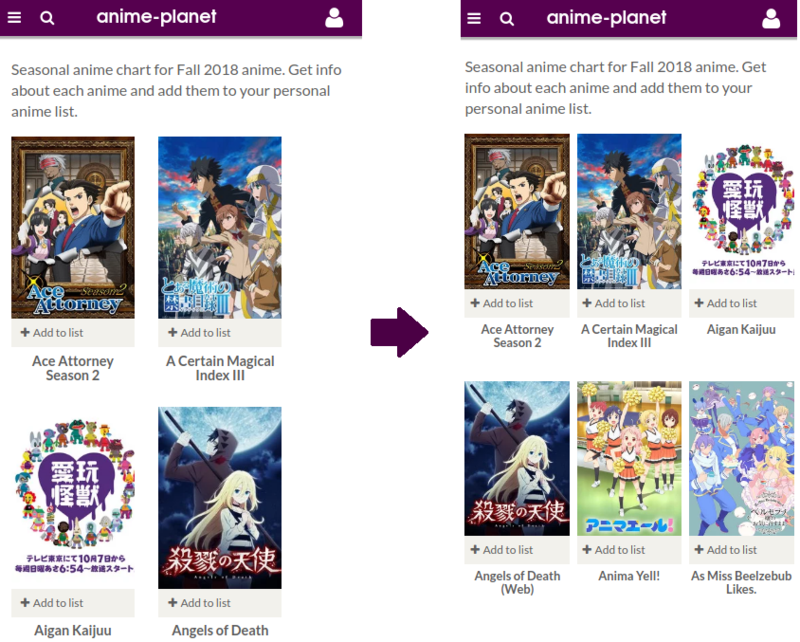 Site code has been changed for a dramatically better mobile experience when browsing lists of anime and manga. 3 entries wide now fit per row on a mobile screen, and responsiveness when shrinking a browser window now performs much better on many pages. 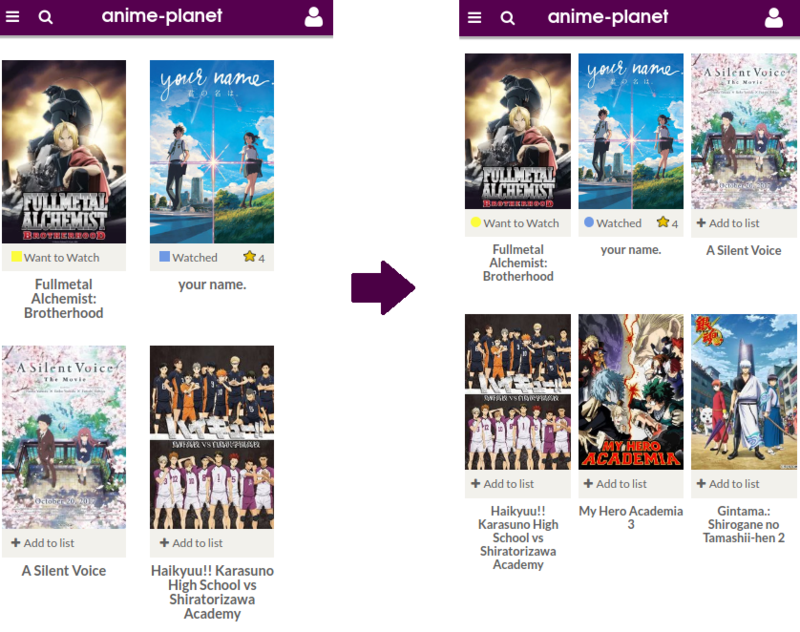 Default “cards” per row is 7 now, instead of 6 (such as on the browse anime or season charts pages). 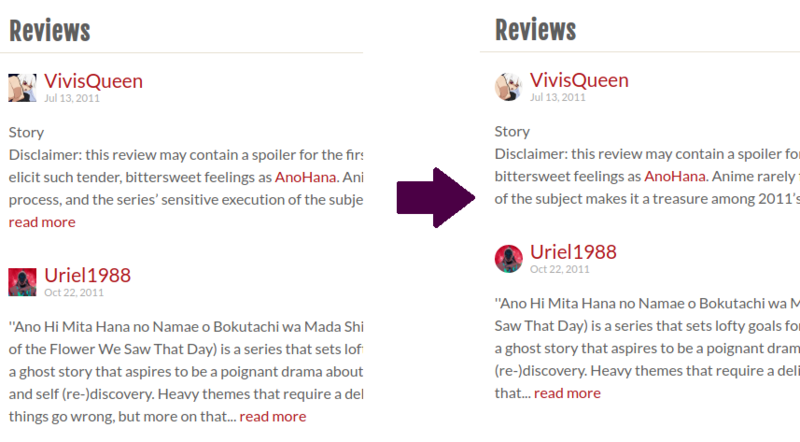 5 recommendations display on the anime/manga entry pages, instead of 4. 5 “known for” cards appear on staff pages, instead of 4. Avatars across the site are now circular, except for your large avatar in your profile. The forum avatars are still square for now, but we’ll update some of these to be on-brand in the future. Status colors for user stats are now circular. Many more updates to come in the future - we’re excited to show you Anime-Planet new logo and mascots in the next few weeks. Thanks as always for your support of Anime-Planet! jk804, Soron, Ryan1555 and 20 others like this. Yes we're finally no longer squares! Love these changes. zala, ZetsubouKaiji, Nitroglycerin and 1 other person like this. Awesome that changes are happening, thanks for the update! thor123 and Nitroglycerin like this. Edgelord Angels, now you know the changes are legit. Indeed, we are now circles. So um, @sothis .... why are you loading 2 different jquery versions? Also, the "fallback" hack you have on the non-forum pages doesn't work. Disclaimer: I do web development and I like to break things! Edit: I just noticed that names are getting cut off on loved/hated characters on the profile page. It doesn't have the same problem with the Suggestions/Related listings. I welcome the changes from our anime overlords! Displaying seven cards per row, to me, seems a bit... strange. I think an even number of cards would be easier for users to count and keep track of. Is eight possible? I don't mean to sound picky, since that's my only gripe. I really do like the wider layout and it looks great on my phone. Also, I noticed that the bottom row on the Watch Anime Online page only has two cards if the list has more than 30 items-- no matter what the filters are. This is cool and all, but is there a way to revert back? I sort of liked the old one more. No. that's not how design updates work. We're going for usability and appearance, not what feels strange or not ;) 7 fills the space well at a decent size, so that's what we set it at. Is anyone else experiencing a bug wherein different series in one's lists are differently sized seemingly based on how long the title is? talking about design shouldn't UnBoy be removed from the front page it has been there for years literally, the kickstarter also ended years ago. AP looking sexier and sexier. Great work. Brilliant changes, thanks for all the time and effort devs etc. Looking forward to seeing the new branding also! * Happy to see that the visual density of series lists is now increased, packing things in tighter rather than stretching pages, while also making more use of screen width. Sevens multiplication is a little more complicated but it's also more unique and fun. * Looking forward to seeing the new logo and mascots! I like the current logo but the current mascot I've been meh about to be honest, so I'm excited to see the next one.